Scientists have discovered a cluster of underwater asphalt volcanoes rising from the sea floor just off the coast of Santa Barbara, Calif. The seven volcanoes, about 65 feet tall, probably last disgorged petroleum and natural gas into the seas 30,000 to 40,000 years ago, during the most recent ice age, according to geochemist David Valentine of the University of California, Santa Barbara. Valentine and his fellow researchers first came across the asphalt behemoths in 2007 using a white, three-seater Navy submarine operated by the Woods Hole Oceanographic Institution. Bundled in warm, nonflammable clothes and crammed against the damp sub walls, they were trying unsuccessfully to find methane seeps. Frustrated, they took a detour, curious about a place where earlier surveys had indicated some kind of mound rising from the sea floor 726 feet from the surface. They peered through port holes into the gloom. The sub's lights illuminated only a few feet. "We were coming across very boring, very silty sea floor with not a lot of life on it. Suddenly we saw a cliff looming," said Valentine. "Then there was a giant black wall teeming with life." The nearly vertical black wall seethed with basket stars, wolf eels and fish. It seemed to be a deep water reef of sorts, but it wasn't coral. At first, the submarine occupants thought the black cliff face was basalt. The sub's robotic arm got a hold of a chunk of it. The little vessel shook. To the researchers' surprise, the piece snapped off like hard candy: It was asphalt, left behind from the last greasy eruption. When they got to the surface, the researchers examined the piece. It was lightweight, only a little denser than sea water, and peppered with holes bored by marine animals. Critters crawled out before their eyes. Over the next two years, funded by the National Science Foundation, Valentine and his team explored the big mounds in the tiny, battery-powered sub, whirring through cold depths beyond the reach of scuba divers, dodging junk that litters the sea floor: old nets, discarded Christmas trees, the occasional torpedo. They found brittle cascades of hardened asphalt rippling down the volcanoes' flanks. Though dormant, two still burped bubbles of methane here and there. Some were steep and craggy, looming in total darkness. Some had shallow craters at the top. All were made of solid asphalt. The volcanoes are located in an area of the sea floor where layers of sediment have provided researchers with a kind of geophysical archive, like bands of a tree trunk. There also are tar deposits filled with remnants of ancient marine life. 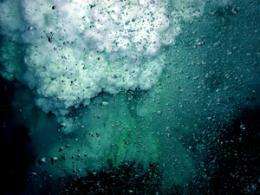 Researchers studying these sites had previously found evidence of several cataclysmic methane-gas releases about 40,000 years ago. The methane had fostered bacteria that leeched oxygen out of the water and created a dead zone. They wondered what had happened. Now "we found a candidate," Valentine said. Valentine worked with colleagues from the Woods Hole group, the University of California, Davis, the University of Sydney and the University of Rhode Island. The volcanoes are located on a fault, he said. Mostly likely, if an eruption ever happens again, it will occur somewhere else on the fault line, Valentine speculated. Like a 15th-century explorer, Valentine got to name the volcanoes. The depth surveys of them reminded him of pictures he had once taken in Florence, Italy. The largest, which stands alone about a mile from the others, he called Il Duomo, after the Florentine cathedral. The next largest is Il Duomito, and the smaller ones, Los Duomitos. (c) 2010, Los Angeles Times. "Underwater volcano releasing liquid droplets of carbon dioxide. Yellow parts of the plume contain tiny droplets of molten sulfur. " And people complain about oil spills. And you, my friend, are a one trick pony. In future, you need to post comments with your name only. The information content will be equal to that above (i.e. nil), and we all already know your thought (singular). What happens when a REAL volcano, not of oil but of magma, breaks through an oil or coal field? Just like these ancient oil spills, there must be instances where magma hits oil/coal and releases great quantities of CO2 and/or methane creating environmental damage far beyond anything man has done. How did the environment recover? How long did it take? We speculate about meteor strikes destroying the dinasaurs, but it may have been terrestrial volcanic activity releasing huge clouds of CO2, methane and particulate carbon. And what are the odds that this will happen again? And what are the strategies for defense against this? This discovery looks monumental. Think of this as an undersea version of the Rancho La Brea Tar Pits, with all sorts of biota preserved in the solidified melt... And the layering is just wonderful for dating. FYI the "Tar Pits" has millions of specimens & is THE worldwide resource for ice age information on climate & evolution.